I have been super busy with the gallery this month! We have several events happening at Chroma Studios during December. We would love to see all our friends, new and old, for the holidays! We have extended our open hours to Tuesday-Saturday 12-6 pm. Shop local and buy from living artists! 2. On Saturday the 6th, Chroma will be hosting its first ever figure drawing group from 1-4 in the Gallery. We have limited space, so please call to reserve your place. Cost is $7 per session or prepay 5 sessions for $25. The group will meet every Saturday from 1-4 pm with the exception of the 27th of December when we will be closed. Call Paula at 259-6320 for more info. From 20 to 30 available seats depending on how much space the performers need. The first concert will be performed by Chroma founder Aaron Lewis and tickets will be sold for $5.00 call 908-1392 to reserve your seat today. 4. 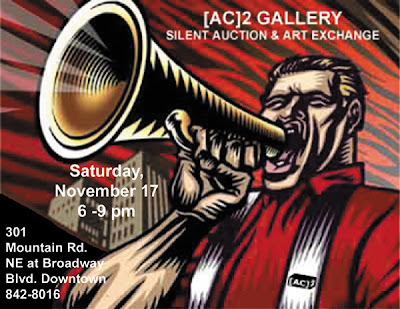 On Friday December 19th Chroma will have a closing show for the Silent Auction and wrapping artwork for the winning bidders. This show will be from 5-8:30 as well. Call 259-6320 or 908-1392 for more info. This has been an awesome month! I’m finally getting back into a routine of painting every day. It feels really great to be back at the easel. It’s been over 7 months since I lost my dad now and while some of you may be tired of hearing about it, I can’t let it go that easily. Obviously. I have now finished exactly 2 paintings since April 9, 2008. Which is nothing compared to what I usually produce. I am more than ready to get back to my regular prolific self. The studios/gallery are getting easier to run, my husband has been helping out more and we are about to have a virtual assistant to help with some of the load. So, now I will have more hours in the day for painting. Plus, and this is pretty important, I have ideas coming back into my head that fit with my usual happy thoughts and paintings. I guess I should retract my previous statement, I have actually finished more than 2 paintings since dad died. Those other paintings I don’t count though, because they were grief paintings and will never be sold. The 2nd painting I finished (see the last post), now has a title. Since I was praying for a good election result while I painted it, I have titled it “Hopeful 2008”. I have been busy scheduling shows for the gallery for 2009 and have decided to do a featured show of my work in April. Yesterday I spoke with the woman who is licensing my needlepoint designs and got her ok to do a needlepoint/art show. I’m thinking about hanging the paintings alongside their corresponding needlepoint canvas and perhaps have a couple of them stitched to show what they look like once they are done. In the meantime, next month we are doing a silent auction show to benefit the local Roadrunner food bank. 50% of the auction proceeds will go to the food bank with the other 50% going to the artist that created the work. I will post some of the pieces on my Chroma Studios blog so everyone will have a chance to bid on them, even if you can’t make it to the gallery! If you are a local Albuquerque artist and would like to participate please contact me as I would like to fill the entire gallery with the silent auction pieces. At the end of the silent auction, closing reception, we will have a fun event, an artist exchange where artists will be able to trade their work with other artists in the show. Any pieces that don’t sell in the auction, or extra pieces that artists bring in will be available for the exchange. Unless, of course, you aren’t interested in participating in the exchange. Just a fun event for the Holidays!